New Orleans seems to be the place this year. Just a couple weeks ago, the nation’s cardiologists gathered in a convention center just south of the French Quarter. And the last few days it has been the endocrinologists turn in the Big Easy. 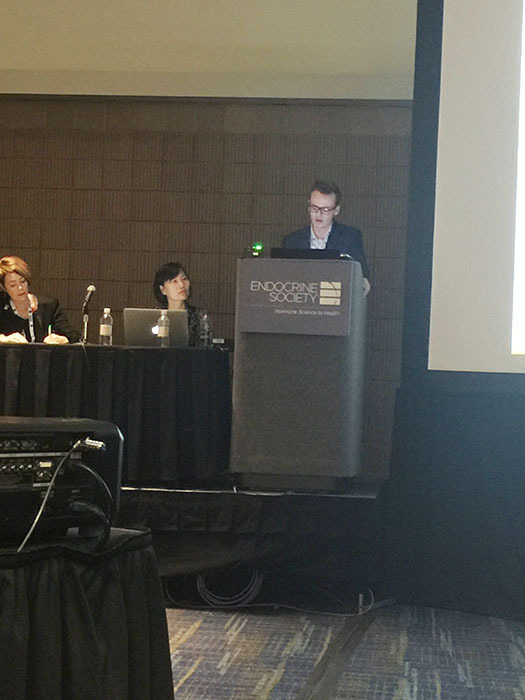 ENDO 2019 is finishing today, but has already featured some fairly monumental events. As an undergraduate research assistant in the lab of E. Dale Abel, MD, PhD, Jesse Cochran has already amassed a string of successes and recognitions. 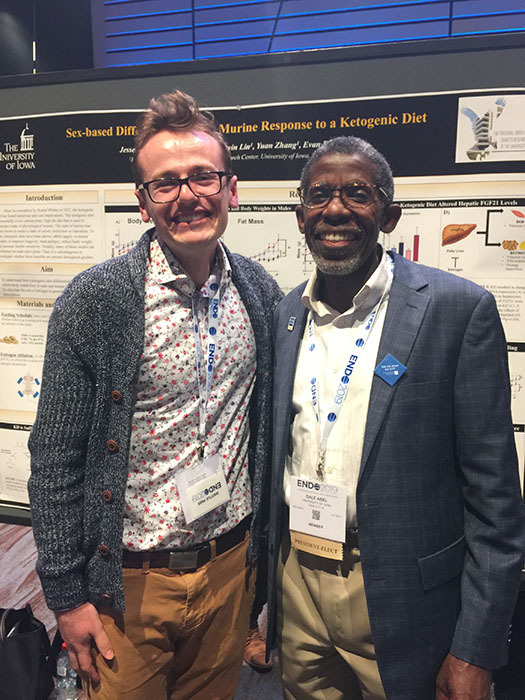 His presence at the annual meeting was funded in part by a student research grant and his receipt of an Endocrine Society Summer Research Fellowship. On Sunday, Cochran delivered an oral presentation revealing the results of his investigation into the effects of the ketogenic diet in an animal model. Working with Abel as senior investigator, Cochran found that the “keto diet” results in diminished results in females, with reduced weight reduction and blood-sugar control. A press release on the results has more information. For his efforts, Cochran won a Best Undergraduate Presentation award. Rea Nagy, MD, second-year fellow in endocrinology, was also present this week at ENDO. 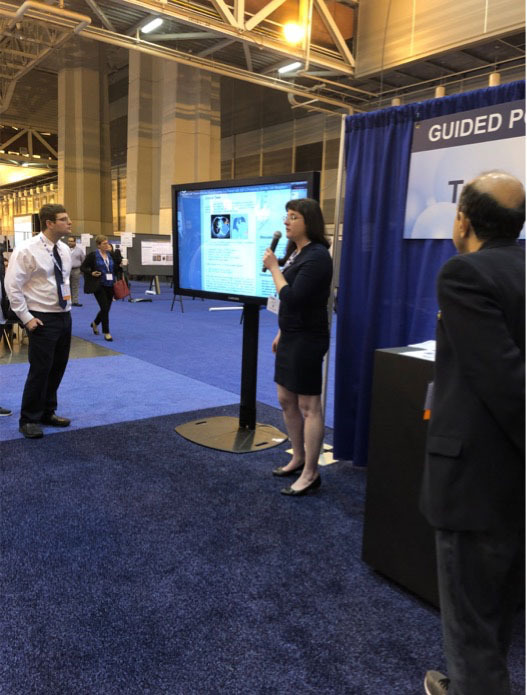 Nagy was one of the high-scoring trainees presenting in the Presidential Poster Competition. 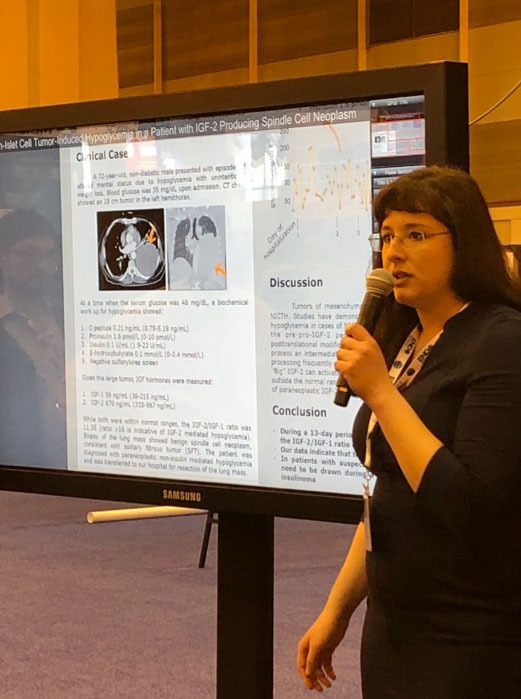 Her presentation, “Non-Islet Cell Tumor-Induced Hypoglycemia in a Patient with IGF-2 Producing Spindle Cell Neoplasm” was selected as one of the best this year in the field of endocrinology. In perhaps the biggest news of the four-day conference was the swearing-in of Abel as the Endocrine Society’s newest president. The outgoing president and professor of medicine at the University of Pennsylvania Susan Mandel, MD, MPH, handed over her gavel to Abel, who then delivered his first address to the organization as its newest leader. In a preview of his remarks, Abel also gave an interview in which he detailed what the society has meant to him and what he intends to make a focus of his coming term. Being a part of a community of individuals who are by nature curious, but at the same time inclusive and empathetic, certainly has been very attractive and has kept me engaged. I joined the Endocrine Society in the 1990s when I was in training as an endocrine fellow. It was very clear to me that there was a tremendous passion among Society members for the field, for each other, and for advancing the mission of endocrinology, in terms of research, clinical care, and advocacy. Congratulations to all three—Cochran, Nagy, and Abel—on representing the University of Iowa so well at this year’s meeting. Another significant development this week was the creation of a new Twitter account, just in time to get tagged in a slew of photos. Give @IntMedAbel a follow!